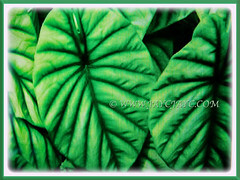 Giant Caladium or Elephant’s Ear is popularly grown for its dramatic, distinctive and enduring foliage. 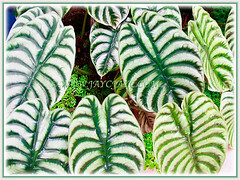 Foliage is shaped like an arrowhead and is a mix of copper and deep green with a silvery sheen veined pattern to them. It is one of the ‘Jewel Alocasias’ that is highly sought after by collectors of rare plants. An exotic Alocasia that will simply be outstanding in a garden landscape, to say the least. 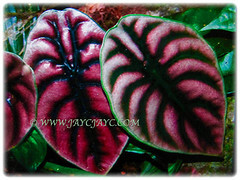 Common Names: Giant Caladium, Elephant’s Ear, Jewel Alocasia. Etymology: The genus name, Alocasia is derived from the Greek word, kolokasia, meaning lotus root which resembles the root of this plant. Origin: It is native to Borneo. It is widely cultivated elsewhere around the world. Plant type: An ornamental, rhizomatous and perennial plant. 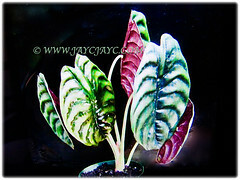 Features: Alocasia cuprea is from the genus Alocasia that comprises of approximately 79 species. A slow-growing, rhizomatous and perennial plant that can reach 1 m tall and 0.8 m wide. Juvenile leaves shimmer and have a glossy brown colour. As the long petiolate leaves mature, the colour becomes darker and dramatically striped. Its peltate, green-purple leaves are striped with bands of bright metallic copper. 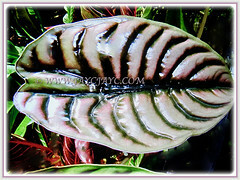 Its waxy and large leaves can be more than 40 cm long and have dark metallic bronze green top and reddish-purple undersides. 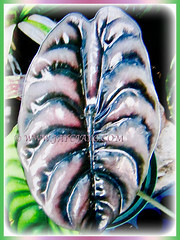 An amazing alocasia with stiff and fairly thick leaves that have a coppery metallic appearance. It is prized for its iridescent, copper-hued foliage. 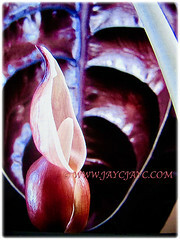 It produces a creamy-white inflorescence with insignificant spathe that covers the spadix that bears the tiny flowers. Culture (Care): Alocasia cuprea or Elephant’s Ear grows easily with least maintenance. Light: Semi-shade though best with morning sun or bright light. Can tolerate light to partial shade. Avoid direct sunlight that can scorch its foliage. Moisture: Moderate to high water needs. Water regularly as it needs constantly moist soils. However, allow the soil to dry slightly between waterings. It benefits from a humid environment. Soil: Grow in fertile, loamy and well-drained soils. Others: No pruning is required. Just remove withered or sunburnt leaves to keep it aesthetically attractive. Wipe the foliage regularly to keep it dust-free. Feed once monthly with a balanced liquid fertiliser for foliage plants. Take note that all parts of the plant contain calcium oxalate crystals, an irritant to the mouth and oesophagus. Also, it’s toxic to cats and dogs. Generally, free from serious pests or diseases. However, do watch out for mealybugs. For subtropical and temperate regions: Hardiness: USDA Zone 11. 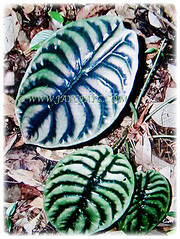 Alocasia cuprea or Giant Caladium is frost tender and goes dormant below 7°C. It requires a day temperature of 10-30°C and night temp of 12-18°C. An evergreen plant that thrives well in tropical and subtropical regions. This beauty is usually grown as a houseplant or in a conservatory. Provide sufficient sunlight outdoors and bright light, warmth and humidity if grown indoors as a houseplant. Water moderately from spring to early autumn but keep fairly dry from then onwards into winter. The plant will flower at any time during the growing season. Advisable to propagate by dividing the offsets in spring. Propagation: Easily by seeds. Alternatively, by division of the offsets. Usage: Alocasia cuprea or Elephant’s Ear with its large, dramatic and variegated leaves will be an excellent ornamental plant in the garden or landscape. Very suited for container planting and raised planters. An eye-catchy plant that’s perfect for large terrariums. If you desire to create a tropical theme, this beauty suits your purpose. 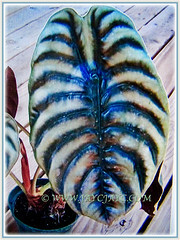 Great as a houseplant for indoor decor, especially in non-tropical climes or located at the courtyard, patio and deck. 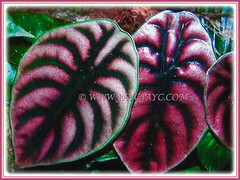 Caladium ‘Lucky Purple’ from Thailand is simply spectacular!